When does a trip to the rainforest become a luxurious escape? At the new (opening November 2012) 12-guest Kurà Design Villas set in the Osa Peninsula rainforest of Costa Rica, it’s the moment you arrive to one of the hillside villas, sink into the cozy sling of a patio hammock—Mojito in hand, of course—and watch the sun set over the Pacific from a private terrace. As the newest retreat in the Cayuga Sustainable Hospitality collection, a company that manages Earth-friendly lodges, hotels and small inns in Central America, interiors are all stylish eco-elegance, full of natural materials such as teak, bamboo and glass. Kurà features six private guest villas, including luxurious amenities such as a king-sized bed with quality linens, plush towels and bathrobes, double rainfall-style shower, private minibar and wine cellar, espresso coffeemaker, iPod docking station, and free wireless internet, in addition to a full-service spa. And with a 19-metre (62-foot) saltwater infinity pool; outdoor lounge, bar and spa areas; and 360-degree view Sky Lounge for watching a star-glittered nightsky, even lodge lizards can enjoy the great outdoors while waiting for their massage. GREEN TRAVEL: Two Costa Rica landscapes. One awesome vacation. The problem with choosing a vacation? Too many choices. He wants the mountains. She wants the beach. Why choose? 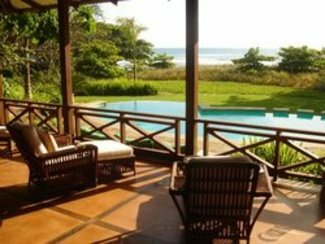 Cayuga Sustainable Hospitality, a company that manages Earth-friendly lodges, hotels and small inns in Central America, serves up a new surf and turf Costa Rica vacation combo that makes it easy to explore the famed Santa Teresa beaches and lesser-known Turrialba mountains – all in one visit. Located just steps away from the pristine, white-sand Santa Teresa beach, Latitude 10 Exclusive Beach Resort is a romantic and private eco-getaway that contains just five guest casitas. As a hub for adventure and complete mind and body wellness getaway, spend your days kayaking and snorkeling the clear blue waters, surfing on some of Costa Rica’s finest breaks, rebalancing with a private yoga class or indulging in a deep-tissue massage. Located along the white sand beaches of Playa Solmar and just minutes away from bustling downtown Cabo San Lucas, Solmar Hotels & Resorts is a great choice for families seeking a kid-friendly vacation destination. With an array of accommodation choices, on-site activities, close proximity to some of Los Cabos’ most popular attractions and a “Kids Stay & Eat Free with Parents” policy available through the spring, summer and fall months, Solmar Hotels & Resorts can turn a family vacation into reality. The collection of Solmar Hotels & Resorts is ideal for families as they feature all-suite accommodations with two beds, sofa sleepers, two bathrooms, separate living room areas and kitchenettes. Solmar Hotels & Resorts’ close proximity to many of Los Cabos’ local activities allows guests to easily leave their hotel to enjoy the unforgettable activities available in the destination. Kids can enjoy a first hand experience with friendly dolphins and in-water interaction at Cabo Dolphins. Families can also take a horseback ride together along the beautiful Medano Beach or venture out to the dramatic desert landscape for an adventurous hike or safari ride. Another popular activity is a glass bottom boat tour that sails past the famous El Arco and neighboring sea lion colony, giving visitors the chance to view the natural beauty of Los Cabos and colorful marine life of the Sea of Cortes. Sonesta St. Maarten Resorts’ “Fall Frenzy” contest is giving away a free vacation. Book any existing package online at www.sonesta.com/stmaarten for travel September 1 - October 31, 2009 and you are automatically entered to win a free three-night return stay at Sonesta Maho Beach Resort & Casino and Sonesta Great Bay Beach Resort & Casino. Return stays are valid April 4 - December 18, 2010. Share the Love: Two-for-one All-Inclusive special! Guests stay all-inclusive and bring a friend all-inclusive for free. Valid for bookings made by August 31 for stays through December 15, 2009. St. Maarten Seduction: Sonesta Great Bay Beach Resort & Casino welcomes couples with its romance package. Valid for travel through December 19, 2009 with ocean view rooms, fine dining and more for $199 per night. click thru to full story at Fodors.comLooking for a beach all to yourself? I know I am! Here’s Fodor’s top recommendations for where to find solitude, comfort, and a little of that indescribable Caribbean magic. Now, if only my bathing suit fit and my legs weren’t glow-in-the-dark white. Oh well, on a private island or remote resort, who cares!